Grief is universal. There isn’t a person alive who has not been touched by it. Although the ways in which each of us processes that grief or the imminent loss of a loved one may be different, it’s something everyone can relate to. Conor O’Malley (Lewis MacDougall) and his mother, Lizzie (Felicity Jones), have been on their own for a long time. Raising Conor by herself, Lizzie surrounded him with love, art and imagination. Conor must now deal with Lizzie’s terminal cancer with virtually no support. He goes mostly unnoticed at school, save the regular beatings he receives from the school bully, and his cold, domineering grandmother (Sigourney Weaver) treats him as an inconvenience while he attempts to take charge of Lizzie’s care. 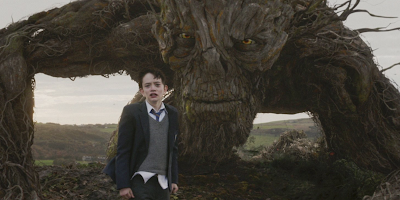 After a series of nightmares, Conor is then visited by a giant tree monster (Liam Neeson). The monster calls on Conor at 12:07 am each night to tell him stories. After the the third story, Conor must tell his truth to the monster. The monster’s stories, each told through beautiful animation and narration, serve as examples of human complexities. Each time Conor and the monster meet, the consequences intensify, ranging from destruction of property to a revenge beating. These encounters coincide with Lizzie’s worsening condition and her treatments. All leading up to an intense and extremely emotional climax. The performances of the cast are authentic and gripping, particularly those of MacDougall and Jones, both of whom will break your heart. Liam Neeson’s voice was made for this type of work and his soothing tone brings a humanity to the tree creature, which, voiced by anyone else, might have been a bit terrifying. The special effects are wonderfully done. Naturally, the monster is CG, but the animation is on par with the Ents from Lord of the Rings and it doesn’t distract from the live action. 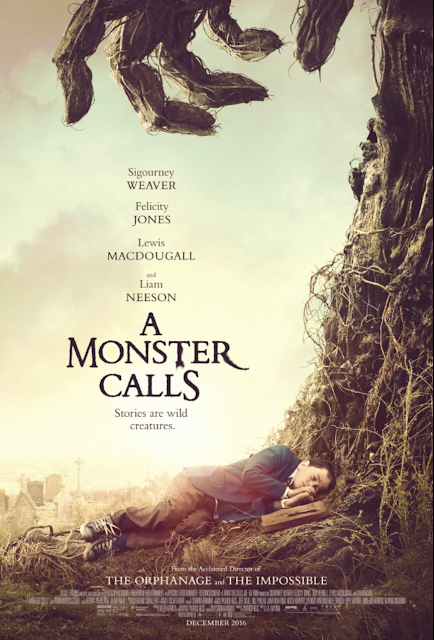 There are some genre elements in A Monster Calls that might be a bit much for younger children and it is an emotional rollercoaster, but it is a film with a message. This imaginative, fantasy film will require several tissues to wipe the leaky holes in your face. A Monster Calls will be in limited release beginning December 23rd and opens wide on January 6th, 2017.